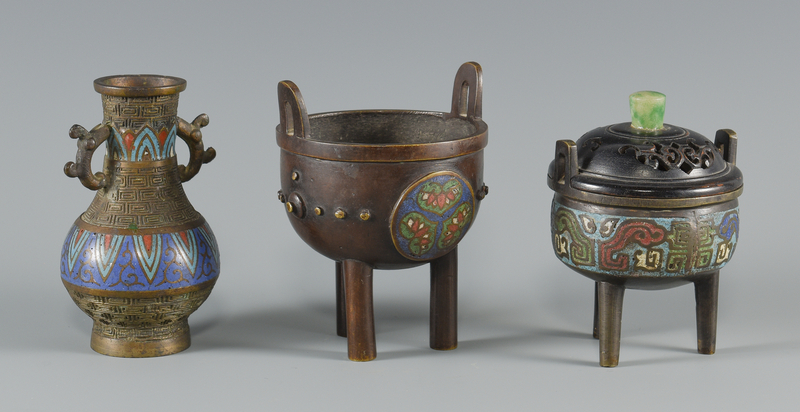 1st item: Chinese bronze and champleve enameled censer having a pierced top with green stone finial, geometric designs to the body and tall straight legs. 4 1/2" H. 2nd item: Chinese bronze and champleve enameled censer, open form with champleve medallions to the body and tall straight legs. 4 5/8" H. 3rd item: Chinese bronze and champleve enameled vase with two bands of champleve decoration to the body divided by raised bands of key fret pattern and archaistic handles. 4 3/4" H. All items late 19th/early 20th century. Provenance: Knoxville, TN collection. CONDITION: Slight bending to legs of censers, some oxidation to vase.